If you live in a country subject to VAT taxes please purchase patterns via Ravlery. If you’d like your patterns on Ravelry purchase HERE instead. 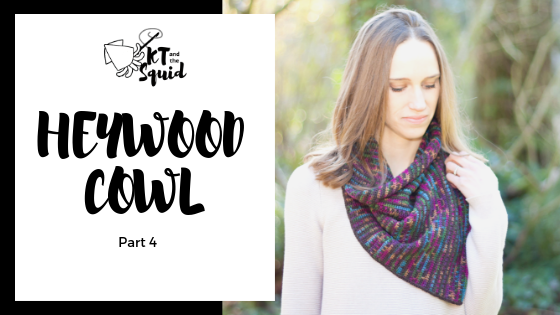 Part 4 of the Heywood CAL is here! If you’re ready to get your cowl done you can purchase the full PDF now! You will end on row 168 with 135 sts. Do not fasten off color A, fasten off color B. Pick up color A, ch 1, evenly sc down the side of the cowl working 5 sc for every 6 rows. With the wrong side facing out slip st the first 51 sts of the last row (start 1 st after the st marker) to the 51 chains of the foundation chain. Ch1, evenly sc around the top of the cowl, join with a slip st to the 1st st.
Fasten off, block as desired, weave in ends. Step 1: Pop into the KT and the Squid Official Group and share a photo of your work in the appropriate thread. Each photo you share for each part of the CAL will count as an entry into the final giveaway! More info about this will come later. Step 2: Update your Ravelry project page. I’ll be back on Friday with the next step! Join my VIP Mailing List!